Description: Novice nail stylist Sonomi, gets few customers and gets stuck with odd jobs despite her talent because of her bad reception skills. 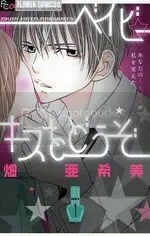 She starts to go out with the owner Shinji, but their relationship doesn’t progress at all. In front of the half-dead Sonomi, a charismatic stylist Ishikawa appears…!? Also, out of curiosity, are those raws Japanese or Chinese? u welcome ,they are in Korean .I’m gonna upload the 3rd vol on my blog . Hey guys, have you decided to translate the manga in the end?